It might be the most important “comic book” ever created. “March” — the collaboration between Congressman John Lewis, his congressional staffer Andrew Aydin and illustrator Nate Powell — is a monumental work of nonfiction. It propels the spirit and power of the Civil Rights Movement’s nonviolent action into the 21st century. The trilogy — the first graphic novel ever to win the National Book Award and the Robert F. Kennedy Book Award — has also expanded the historical canon to include comics. Schools in at least 40 states are teaching “March,” and it’s an international bestseller with a half-million copies in print in seven languages. But there is something else that makes “March” special, and it lives outside the pages. It’s the friendship between a 77-year-old icon of the Civil Rights Movement and a 33-year-old second-generation Turkish Atlantan. 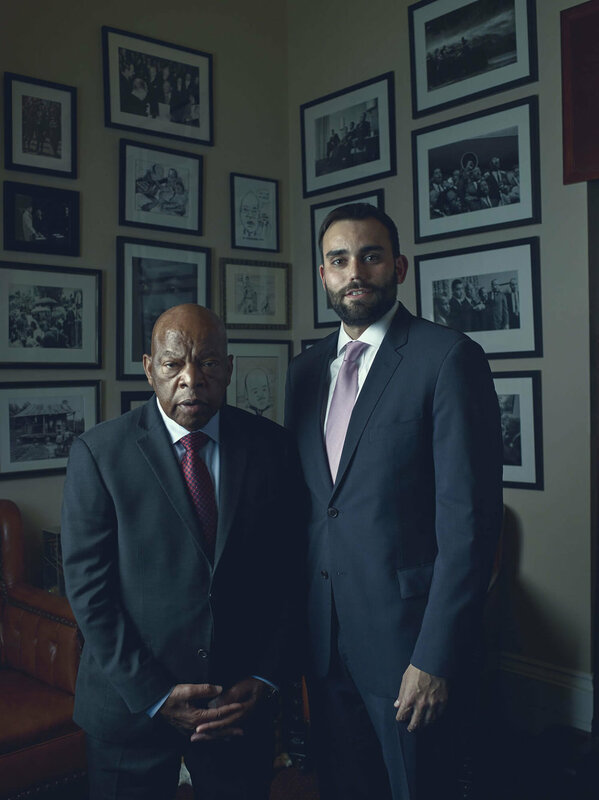 Aydin has worked for Congressman Lewis for a decade, but their co-author relationship began in 2008 when Lewis stepped to Aydin’s defense after he took some ribbing from coworkers when they learned he planned to spend his vacation at a comics convention. Five years later, they had published the first volume of “March,” and today, after three books and long traveling tours, the unlikely pair behave more like family than congressman and aide. Beyond the personal joy, the two men’s relationship also gives us proof that the teachings of Civil Rights Movement and Martin Luther King Jr. cross the generations. Lewis had already two other books, but “March” is unique because of his bond with Aydin. Had Lewis not lived the life, these stories would not exist, but if Aydin had not been so persistent about fusing his comic-book fandom with his professional and post-graduate interest in the Civil Rights Movement, then the books themselves would not exist. Together, they are sharing true stories to inspire the next generation. With “March,” a trilogy whose core is the universal principles of love and devotion to service, these three Southerners demonstrate that we can work together, across disparate interests, if we seek the one interest that is common to us all: peace. “March” shares Congressman Lewis’s life stories from when he was a little boy preaching to chickens in Alabama to his work leading sit-ins in Nashville and Freedom Riders through Mississippi to his current role as an elder statesman in Washington. The books illustrate how nonviolence can empower a person at any age, facing any problem. But choosing the way of peace, like anything worthwhile, takes practice — and training. In “March,” Lewis and Aydin show how a young man with courage and conviction can learn to endure countless beatings and emerge stronger on the other side of 41 unjust imprisonments, emboldened in the earned armor of love. While violence is loud and easy, love is quiet and calm and must be sought. Lewis first absorbed the philosophy of peace from his family and at church in Troy, Alabama. In Nashville — where he studied and worked as a janitor at the American Baptist Theological Seminary — he discovered Mahatma Gandhi’s writing and transcendentalist Henry David Thoreau’s “Civil Disobedience.” It’s also where he met activist and professor Jim Lawson, who exposed him to the Fellowship of Reconciliation’s work to put nonviolent resistance into action. Lawson put Lewis to work, too, writing the “Dos and Don’ts” of the sit-in movement. With a ream of paper and the help of a fellow student, Bernard Lafayette, and a secretary, “We cut the page in half, distributed more than 500 copies. So on February 27th, when the first mass arrest occurred in Nashville, every single person that was arrested had a copy of the ‘Dos and Don’ts.’” Lewis was learning the importance of organized preparation. Lewis and those who marched with him confronted bats and guns, wielded both by uniformed authorities and lynch mob terrorists. They were armed in their pursuit of peace with only how-to guides for resisting violence. It takes courage to eschew anger for kindness in the face of snarling dogs and fire hoses. On the day of my interview with Lewis and Aydin, U.S. Senate Chaplain Barry Black told me that Lewis “lives to illuminate.” So I asked Lewis, who is often called the “Conscience of Congress,” how he remains a light for hope and peace when someone makes him angry. Besides the “Do’s and Don’ts,” Movement foot soldiers had another how-to guide: “Martin Luther King and the Montgomery Story,” a 16-page, 10-cent comic book created by King and Jim Lawson in 1957. Overshadowed by the more widely referenced narratives of the Movement, such as King’s “Why We Can’t Wait,” “Letter From Birmingham Jail,” and “Letter From Albany Jail,” King’s comic book fell out of the collective memory after the 1960s — until John Lewis’s reelection campaign in 2008, when he defended a young staffer for reading comics. That voice, of course, belonged to Lewis, who had strong memories of the “Martin Luther King and the Montgomery Story” comic. King’s comic explained to contemporaries how to use “the Montgomery Method” of nonviolent action, exhibiting how loving and forgiving violent oppressors while defending human dignity could lead to political change. Lewis remembers it as a “roadmap” that he followed first as a young man organizing sit-ins. When Aydin entered Georgetown University to pursue a master’s degree in public policy — as a night-school student — he built his thesis around that comic book. Aydin and Lewis are extending Lawson and King’s legacy by using the comic-book medium to remind modern activists that nonviolent action remains the way to affect change. There is also a shelf dedicated exclusively to graphic novels and comics. Aydin is, after all, a self-professed “comic book nerd.” And he believes comic books will play bigger roles in the future of literature. Such graphic novels have been nominated before, but “March” was the first to win a National Book Award for Young People’s Literature. So it seems Americans are coming around to the idea that comics don’t belong solely in the Sunday funny papers. Aydin worked on telecommunications and technology policy for Congressman Lewis before pitching the idea of writing a comic book with him. After Lewis defended him for going to Comic-Con and introduced him to “The Montgomery Story,” Aydin had an idea. They found one in Nate Powell, whose vibrant lines and shading techniques create evocative contrasts in emotion. For example, in one of the most violent scenes, when a terrorist’s bomb kills four little girls at Birmingham’s 16th Street Baptist Church, it’s difficult not to shudder. I found myself grimacing and trying to look around the plumes of dark smoke to find the little girls. Powell’s art evokes not only horror, but also hope. He writes cursive script for some of the sermon language about loving the enemy, and he frames a page set in Selma with budding trees to mark spring. Lewis remarks on Powell’s gifted ability, saying he can actually make the “words sing and dance off the pages.” Lewis consistently talks about the importance musicians and other artists had during the Civil Rights Movement. “If it hadn't been for music, the Civil Rights Movement would've been like a bird without wings,” he says. I talked to Jon Batiste, the young pianist from New Orleans who leads the band every weeknight on “The Late Show With Stephen Colbert,” before Batiste’s performance at New Orleans’ 48th annual Jazz & Heritage Festival. Batiste had recently done a segment for the “Colbert” show in which he interviewed Lewis while getting a haircut. Batiste told me Lewis “has a presence about him” that comes “from all he’s been through,” and that he considers Lewis an inspiration to use his music to influence society positively. I show Lewis the page in Book Two of “March,” a scene at the March on Washington when Lewis spoke immediately before King’s “I Have a Dream” speech. The scene depicts Mahalia Jackson in her floral hat and lists other musicians who performed at that momentous event, including Joan Baez, Bob Dylan, the SNCC Freedom Singers, and Peter, Paul, and Mary. Lewis’ office feels more like a museum than the average congressional office. Sunlight pours into the room through floor-to-ceiling glass doors overlooking the Capitol Dome and Independence Avenue. Three walls display paintings, a Wheaties box with Lewis on the front, iconic framed photographs, portraits of King and Gandhi, posters from voter registration drives and from Robert F. Kennedy’s campaign before his assassination. There is a photo of Lewis and President Lyndon Johnson after the signing of landmark legislation near a cartoon caricature of LBJ and Lincoln discussing their similarities. Next to family photos of Lewis and his late wife, Lillian, and son, John-Miles, are images of Lewis and King, their profiles set side-by-side, representing two generations of the Movement that ended Jim Crow. I can’t help but feel the “presence” Batiste described about Lewis. Seeing him and Aydin here in this room, it is not just the museum-like environment that feels special. It’s their friendship, which bucks social conventions and professional norms. The books it produced, lying on the table between us, demonstrate the multi-ethnic and multi-generational endeavor of healing a divided nation. It’s heartening that a comic book-style historical account of the Civil Rights Movement is now being used as a teaching tool in Southern schools. But it’s important to remember that the struggle is far from done. There are 917 active hate groups operating in the United States, and since the election in November 2016, the Southern Poverty Law Center has documented more than 1,000 hate incidents. Lewis says he’s seen many changes in his native region, but acknowledges the lingering burden of the South’s dark history. Those young “March” readers can relive Lewis and King’s nonviolent revolution in these graphic novels and experience how their philosophy of peace in action buried Jim Crow and resurrected the ideal of equality among men and women in America. Lewis’s rhythmic, preacher’s voice shares wisdom and the power of peace. Co-author Andrew Aydin’s narrative structure adds suspense to the wise man’s wild history and emphasis to his advice, while artist Nate Powell’s drawings lift the memories off the pages. The bombs alarm us and Bull Conner’s hoses spray us. We hear the bus engines as the Freedom Riders roll on into the Deep South, and we grimace at the scenes of what greets them. And despite the differences in their backgrounds, Congressman Lewis thinks their compatibility might have something to do with a factor common to all of their backgrounds.